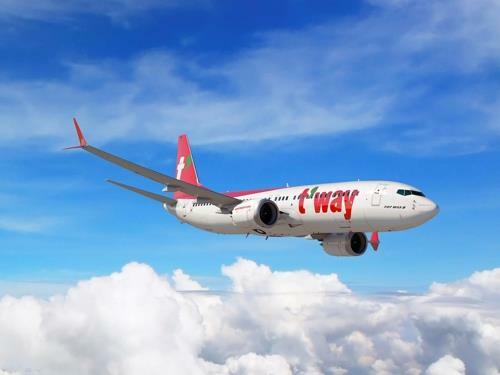 SEOUL, Feb. 8 (Yonhap) -- T'way Air Co., one of South Korea's six low-cost carriers (LCCs), said Friday that its net income decreased 12.7 percent on-year in 2018. Its net profit stood at 36 billion won (US$32.1 million) on a consolidated basis last year, compared with 39.7 billion won a year earlier, the airline said in a press release. Sales, meanwhile, reached a record-high of 731.9 billion won in 2018, up 25 percent from a year earlier, mainly on the back of a diversification of routes and expansion into new markets, the company said. It is the first time since the company's establishment in 2010 that its annual sales have surpassed the 700 billion-won mark. The carrier expanded its operations by adding 13 new routes and five new airplanes last year. Operating income, meanwhile, came to 45.5 billion won in 2018, down 3 percent from a year earlier. The carrier made its first appearance on the country's main bourse in August 2018, becoming the third budget carrier to be traded on the market.